Determine pressure drop, apparent shear stress and shear rate. Designed to attach to ANY C.W. Brabender single-screw or conical twin-screw extruder. 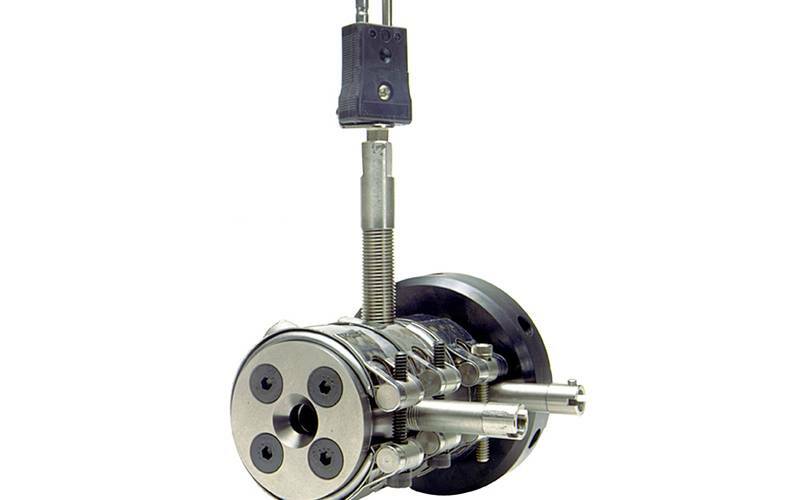 Continuously extruding material through the die to collect pressure and mass throughput data. Works withWINEXT Windows® based extrusion software when using our Plasti-Corder® Torque Rheometer, or by manual calculation. In the round capillary die, material enters the round capillary insert located in the die. A pressure transducer and melt thermocouple monitor and record the pressure drop and temperature of the material before exiting the die. Mass throughput is determined by weighing extrudate over a timed interval. Subsequent measurements are made by varying the extrusion speed to obtain outputs at each pressure value. Substituting capillary inserts of varying L/D ratios meets the requirement for completing the test when using this die.